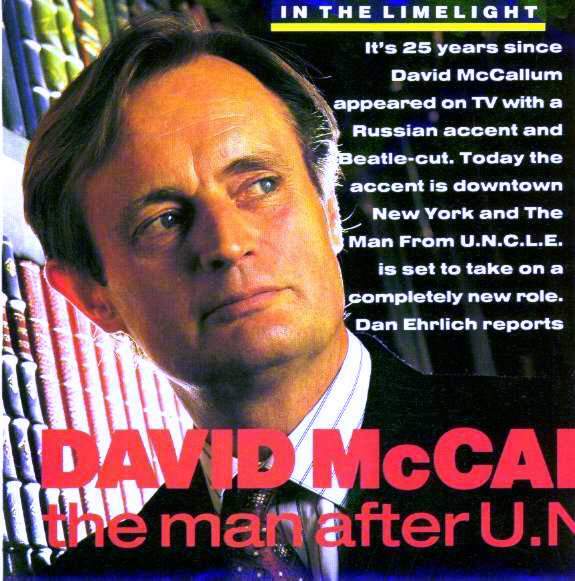 David McCallum: the man after U.N.C.L.E. If you remember the TV series The Man From U.N.C.L.E., you must be older than you look. David McCallum certainly is. He was one of the stars of the show, the slender one with the blond Beatle-cut who, with his chunkier super-spy buddie Robert Vaughn (Napoleon Solo), risked life and limb every week to make our world a better place. At the time he was voted one of America's sexiest males, even though he spoke with a Russian accent and came from Glasgow. Today, the haircut has gone but the boyish charm is holding up pretty well. At 56, he looks about 15 years younger. "My physical appearance hasn't changed that much. Though when I get the urge to exercise, I lie down until it goes away," he jokes. Oh yes, the Russian accent that went with his Ilya Kuryakin role in U.N.C.L.E. has gone too. It's been replaced by the street-smart voice of the New Yorker he's become since marrying wife number two, Katherine, a Big Apple fashion model and socialite. It's been a long time since McCallum's worked in Britain. Now he's involved with Mother Love, a BBC miniseries about a divorcee's obsessive love for her son and obsessive hatred for her ex-husband, which starts on Sunday and a TV movie of the Seventies hit series McCloud with Dennis Weaver. A lot has happened in the 25 years since the series that made him famous came to an end. Most newsworthy perhaps was that his wife of 10 years, actress Jill Ireland, ran off with family friend and budding screen idol Charles Bronson. Luckily for David, as one marriage was collapsing, another was taking shape. 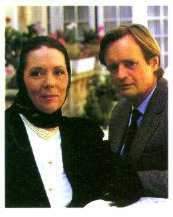 And doing Mother Love, with Avengers star Diana Rigg, brought it all back to him. "It was all so familiar to me. In the film I meet a young American girl and we reveal our feelings for each other in Rome. That's exactly what happened when I met Katherine. She was a New York model and I was doing U.N.C.L.E. "She got some work in Naples for the Italian fashion magazine Ariana. I knew she was there and we just happened to walk into the same lift together." All this time David was still married to Jill, who had already run off with Bronson. He was trying to keep up appearances, but says, "I realized I didn't want to go on with those lies anymore. The solution was a simple stroll in public together. The pictures were all over the tabloids the next day." David admits that for years he found it difficult to forgive Jill and Bronson. But now he sees the split as inevitable. "Jill and I should never have married. We weren't suited." And any old bitterness David may have left is wiped out by his concern for Jill who is now tragically battling against cancer. "Jill is very ill, and I have the greatest respect for the fight she's putting up. She's hanging in there," he says quietly. "But, it's not too hopeful. So if anybody wants to offer a prayer for her, it would be a very good idea." He keeps in phone contact with his ex-wife wherever he is. Their three grown sons (he also has a 16-year-old son and a 14-year-old daughter from his second marriage) mean they've had to keep in touch. "Age and time have produced a certain amount of civility." For now, David's looking firmly towards the future. There's a new film, The Man Who Lived At The Ritz, yet to be released, and who knows, perhaps we'll see him back on the box sometime soon. As he points out, he may live in America but he hasn't exactly stayed away. "I've made Colditz, Kidnapped, two series of Sapphire and Steel, and The Invisible Man all for British TV. Until then it's back to New York, the place he's called home since 1969. As a veteran telly tough guy, he has no problems with the city's reputation for violence. "I don't get mugged. I look like a mugger, so nobody bothers me!" But suggest that The Man from New York might be a fitting title for a new series, and he shakes his head. "I'm still British. I come back here to recharge my batteries. I love going back to Scotland. I even love haggis! Now you can actually microwave it, which makes it very American! But my kids tend to avoid it -- high cholesterol, you know." Maybe those health-conscious kids should give it a try. After all, just look at what it's done for their dad.